Raina, a Gummy Fairy, grinned as she flew over Gummy Forest. Sweet, fruity smells filled the air as she glided down into the forest. She loved the colorful gummy trees and gummy wildflowers that filled her home. From the sky above, the forest was a beautiful rainbow patchwork. “Lunchtime!” Raina sang out. She swooped down to Gummy Lake in the middle of the forest. Raina was in charge of taking care of the gummy animals. All of the animals, from the adorable gummy bears to the mischievous gummy fish, loved her. Her kind and patient nature made her perfect for the job. “Come and eat,” Raina called. She flew over Gummy Lake, sprinkling flavor flakes in the water for the fish. A swarm of bright red, green, yellow, and orange gummy fish surfaced and gobbled up the food. Every day at the same time Raina would give the gummy fish their flavor flakes. The Fairy Code stated that gummy fish needed one serving of flavoring a day. Raina had memorized the Fairy Code Book. Some of her fairy friends made fun of her for following the rules so closely. Berry, a Fruit Fairy, and Dash, a Mint Fairy, were not big on following codes and rules. But Raina liked order and rules. After giving the gummy fish their lunch, Raina poured the rest of the flavor flakes into a hollowed-out gummy log for the gummy bears. Then she poured in some sweet syrup to make a sticky mixture. She rubbed her hands on her dress. A few more flavor flakes stuck on her dress wouldn’t matter. Her dress already had every color of the rainbow! Raina was named after the Great Rainbow that appeared the day she was born. Because she was born under the rainbow, she loved bright colors—which was part of the reason she loved Gummy Forest so much. She blew a few notes on her red candy whistle, and the little gummy bears came out of their caves. The cheerful little bears all lined up at the tree to get a scoop of their sticky treat. Raina made extra sure their food mixture was as sweet as honey. The bears all reached out their paws to get their share. A little red bear slurped down his portion quickly. The red bear took his scoop and then waddled over to the gummy tree to lick his paws. Raina smiled at the line of cute bears. Of all the gummy animals, she liked the gummy bear cubs the best. With their plump bellies and jolly personalities, the bears were fun to be around. Especially little Nokie. Raina looked over at the tree behind her to see the young cub eating. Nokie was always first in line for feedings. Raina smiled at the bright red cub. Then she tucked her long, straight dark hair behind her ears and began to scoop out the food for each of the bears. “Hi, Raina!” Berry called out. The Fruit Fairy flew down through the gummy trees and landed next to her friend. “I thought I would find you here.” She pointed to the line of bears. “I see it’s feeding time,” she said, smiling. Berry liked the gummy cubs too. “Right on schedule,” Raina replied happily. She grinned at the beautiful Fruit Fairy. Berry’s raspberry-colored dress wasn’t stained or creased, like Raina’s dress. And sparkly sugarcoated fruit-chew clips held her hair in a perfect bun. Berry always looked her best. “What brings you to Gummy Forest?” Raina asked. Berry reached into the bag that was slung around her shoulder. “I am delivering some fresh strawberry syrup,” she replied. She held out a jar. When the sun hit it, the red liquid inside glowed. “I just made the syrup this morning. It’s berry fresh,” she said, giggling. “Thanks,” Berry said. She put the jar back in her bag for safekeeping. When the last gummy bear had his serving, Berry helped Raina clean up. Together, they carried the gummy bears’ feeding log over to the lake to wash it. “Have you decided what you are going to make for Candy Fair this year?” Berry asked as she scrubbed the inside of the log clean. Raina nodded her head quickly. Candy Fair was all she had been thinking about! She had been doing research, trying to find just the right new candy to make for the fair. Candy Fair was a spring event that was held every four years at the Candy Castle. All the fairies throughout Sugar Valley displayed their candy in the Royal Gardens. White tents were set up, and each fairy had a booth to show her candy. Fairy Princess Lolli was the fairy who ruled over Candy Kingdom, and she sampled all the candy. The princess and her Royal Fairy advisers gave the fairy with the best candy the honor of the sugar medal. They had a difficult job, but they each had a very good sense of taste and were extremely fair. This year Raina wanted that medal more than anything. It would be the first year that she was competing. Four years ago she was not old enough. But this year was a different story. This year she not only wanted to show candy, she wanted to win. Raina had another reason for wanting to win so badly. No Gummy Fairy had ever won the sugar medal. 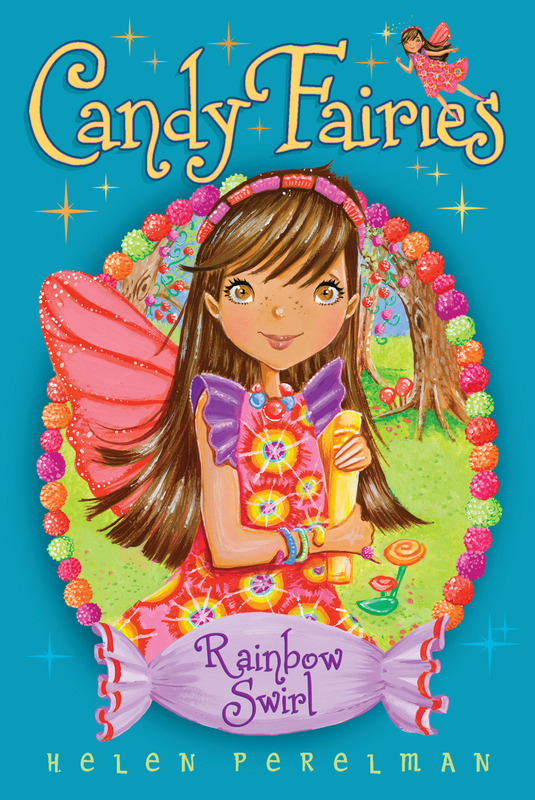 In all the books that Raina had read, she couldn’t find one time that a Gummy Fairy had received the first-place honor. The medal usually went to a Chocolate Fairy, and there were a few years that other fairies had won. But never a Gummy Fairy. This seemed unfair to Raina. This year Raina vowed to make the outcome of Candy Fair different. “We always said that we’d all make candy for the fair,” Raina said. She shook her head in disbelief. “How could you not make something?” she asked. Berry looked down at the ground. She didn’t answer Raina’s question. She didn’t have the right words. She knew how Raina felt about Candy Fair. The problem was that she didn’t feel the same way.